Reviews: (4) See bottom of the page to read them and then share your thoughts! Shirley - ewe’ll love this saucy sheep! 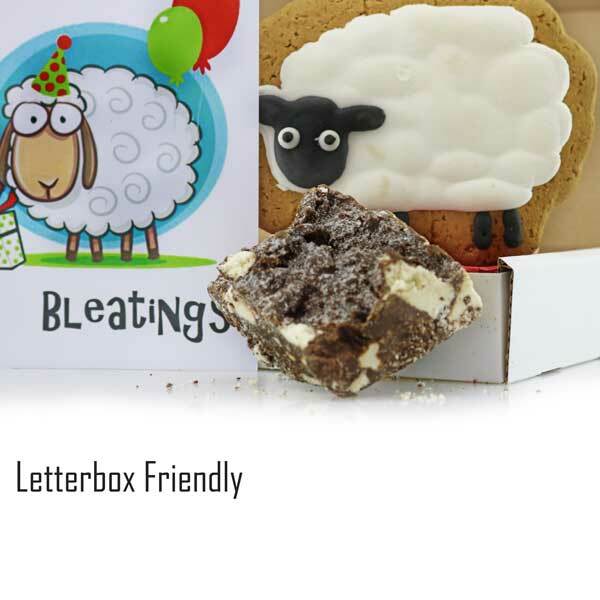 A yummy deluxe iced gingerbread sheep shaped giant cookie 65g. Rocky, Rocky Road 70g - truly chocolatey and biscuity and stuffed with marvellous marshmallows, this chunky Rocky Road Square will surprise and delight. Made with fine, dark Belgian chocolate, soft marshmallows, crunchy biscuit and the perfect sprinkle of succulent sultanas. Gluten Free. The perfect way to say Happy Birthday! Ordered a "letterbox friendly" gift of chocolate orange cake for my son. Arrived the next day, beautifully wrapped. He said the cake tasted amazing. Love the fact that a free card is included too. Excellent product and service. Will definitely be ordering again. Thank you. This was a perfect present for an animal loving person. She was so surprised and loved how different it was. Definitely a nice little surprise in the post.